Gene Shoemaker was an astrogeologist. In fact, he was the very first astrogeologist. He is one of the few people to have established a new scientific discipline. • proved to a skeptical scientific community that some of Earth’s large craters had been caused by collisions with asteroids and comets, rather than Earth’s own volcanic activity. • was the main mind behind the development of planetary impact science. • proposed in 1963 that microscopic life forms could travel from one planet to another on rocks blasted out into space by asteroid impacts. 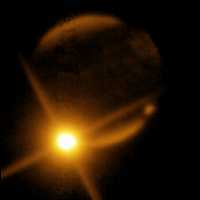 • made a multi-year study of earth-crossing comets and asteroids, which led to the discovery of Comet Shoemaker-Levy 9. 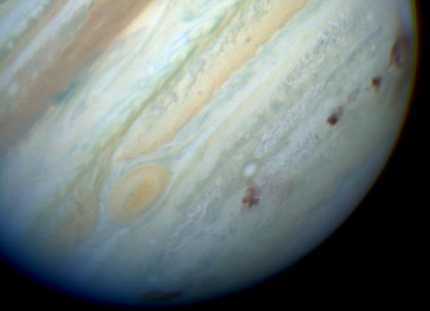 This comet collided spectacularly with Jupiter, the first such collision ever seen by scientists. • discovered about 30 comets. His wife Carolyn discovered another 30 or so. In their later years, they worked together in what Gene described as Mom and Pop scientific research. • had hoped to travel to the moon in the 1960s as a geologist, but health issues intervened. Instead, he selected and trained NASA astronauts for lunar field-work. • was the principal investigator in the Apollo 11 mission’s Lunar Geology Experiment – Apollo 11 was the one that put Neil Armstrong and Buzz Aldrin on the moon. • was a live TV commentator for CBS News on the Apollo 11 mission. • said missing out on a moon landing was the biggest disappointment of his life. • traveled to the moon in the end. He is currently (2014) the only person in history whose funeral ashes have been taken to the moon. Eugene Merle Shoemaker was born in Los Angeles, California on April 28, 1928. His parents were both college educated. His father worked in a variety of occupations including teaching and farming. His mother was a teacher. As a child, he was fascinated and passionate about rocks and minerals, which he collected. He was particularly interested in uranium minerals and their radioactivity. Gene Shoemaker graduated from high school on his sixteenth birthday. Within four years he earned a Masters Degree in Geology from the California Institute of Technology. He was a teaching assistant in his final year, and was younger than most of the people he taught. After Caltech, he joined the US Geological Survey. Shoemaker was 32 years old when, in 1960, he was awarded a Ph.D. by Princeton University for his thesis proving the Barrington Crater was caused by an asteroid or comet impact rather than volcanic activity. Local legends about the crater had been proved right! The Barrington Meteor Crater, Arizona, which Gene Shoemaker proved was an impact crater. Image by Tsaiproject. Shoemaker’s proof lay in the structural similarities he found between the Barrington Crater and nuclear weapons testing sites, including his discovery of the mineral coesite in the crater. This mineral can only form when quartz rock is shocked by enormous pressures and temperatures. This was the first proof that any crater on Earth had an extraterrestrial origin. “For a long while, nobody believed me, but eventually I convinced them,” Shoemaker said. Not content with proving the impact origin of craters on Earth, he soon went on to establish the impact origin of the Copernicus crater on the moon. In 1961 Gene Shoemaker started up the US Geological Survey’s Astrogeology Center in Flagstaff, Arizona and was its first director. The main work was mapping the moon in preparation for landings. Shoemaker himself was slotted to go to the moon, but an issue with Addison’s disease prevented him. Instead, he trained Harrison Schmitt for the job. Gene Shoemaker in astronaut training, and mapping the moon. Shoemaker was the principal scientist involved in designing tests to verify the safety and suitability of landing sites for astronauts. Gene & Carolyn Shoemaker and David Levy were in the fifth year of their joint survey looking for comets and asteroids whose paths cross Earth’s orbit. Gene Shoemaker wanted all such objects cataloged, because he was concerned they pose a threat to our planet. 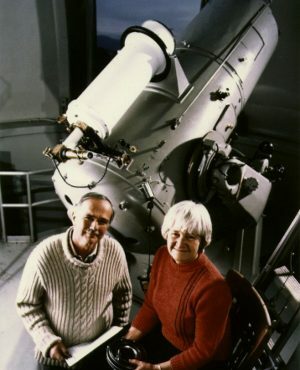 Gene and Carolyn Shoemaker 1994 at the Palomar Observatory. They discovered Comet Shoemaker-Levy 9 on March 23, 1993, recording its image on the Palomar Observatory’s 18-inch Schmidt camera. The comet was a remarkable discovery: calculations indicated it had been torn into fragments by Jupiter’s tidal forces when it passed close to the planet almost a year earlier on July 8, 1992. These fragments were on now course to collide with Jupiter in July 1994. Comet Shoemaker-Levy traveling in a stream of 22 fragments. This image was taken two months before impacts with Jupiter began on July 16 1994. NASA. Never before had such a comet been found, and never before had scientists observed a comet hitting a planet. Astronomers around the world directed their telescopes to track and photograph the comet fragments for sixteen months as they sped ever closer to Jupiter. Image of Jupiter taken by Peter McGregor 12 minutes after an impact. Finally, with telescopes around the world trained on Jupiter itself, impacts of comet fragments began July 16, finishing July 22, 1994. The fragments’ speed was 60 km per second (37 miles per second) and three of the fragments were 1 km or more wide. One of the larger collisions, shown left, released enough energy to meet all human needs for the next 50,000 years at our current usage rates. Another way of looking at the explosion is that it released the same amount of energy as 400 million Hiroshima sized atomic bombs exploding in the same place at the same time. The temperature at the impact sites was in excess of 24,000 Celsius, much hotter than the sun’s photosphere, which is just 5500 Celsius. The explosions were the biggest ever been seen on any planet. Gene and Carolyn Shoemaker watch as images of the first collision arrive from the Hubble Space Telescope. So spectacular was the event, that it became one of those rare occasions when a science story is the headline story in the media around the world. It’s worth remembering that, incredible as these impacts were, they were not quite as violent as the Chicxulub asteroid’s collision with Earth 65 million years ago. This was the impact that perhaps ended the reign of the dinosaurs, killing off more than half of Earth’s species. The Chicxulub asteroid was about 10 km across and the explosion released about 16 times more energy than the Jupiter explosion pictured above. The impacts on Jupiter serve as a reminder that comets and asteroids continue to pose a real threat to Earth itself; they offer visual confirmation of Gene Shoemaker’s belief that impacts are vitally important in both the history and the future of our Solar System. Jupiter with dark scars after the impacts. For an idea of scale, Jupiter’s Great Red Spot is about the same width as 2 x planet Earths and the three biggest scars were almost Earth-sized at their largest. BBC TV made a program in 1990 called From Earth to Miranda about the Voyager spacecrafts’ journey through the Solar System. It was part of their Horizon series. Although we’ve learned a lot more about the Solar System since then, it’s a rather inspiring documentary. Saturn’s moon Mimas, showing a bullet-style impact crater. 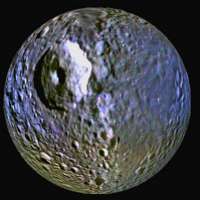 Mimas barely survived this impact. Image by NASA/JPL/SSI/LPI. One section of the program looks at the effects of asteroid and comet impacts on different sized moons. Gene Shoemaker makes what could be a tough demonstration easy. He takes a rifle outdoors and uses it to shoot bullets at progressively larger rocks. The smaller rocks are completely shattered and thrown apart by the impact of a bullet. The larger rocks are cracked rather than broken. The largest rock has a piece broken from it, leaving behind what could pass for an impact crater. Shoemaker was making the point that comets striking small bodies in the Solar System would cause these bodies to disintegrate, larger bodies could suffer serious damage, perhaps cracking right through, while still larger bodies would show impact craters. It’s great viewing and very informative. This wasn’t the first time Shoemaker had shot at rocks with a rifle. David Levy recounts in his biography how Shoemaker persuaded Sue Kieffer, a Ph.D. astrogeologist to shoot at a rock to study the impact. He covered the rock with a cardboard box, to lessen the chances of broken rock coming back at them. Despite his precautions, Kieffer had never shot a rifle before and ended up with it hitting her nose and breaking her glasses! Gene Shoemaker was awarded the Wetherill Medal of the Franklin Institute in 1965, G.K. Gilbert Award of the Geological Society of America in 1983, National Medal of Science in 1992, the William Bowie Medal in 1996, the NASA Exceptional Scientific Achievement Medal in 1996, and the James Craig Watson Medal in 1998. 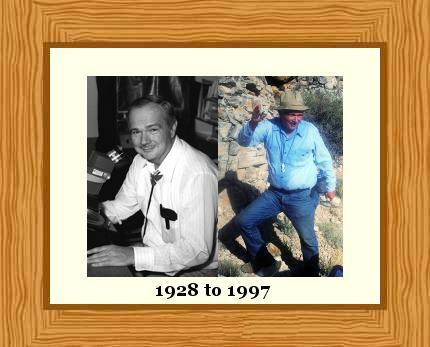 Gene Shoemaker’s life was cut short when, on July 18, 1997, aged 69, he was killed in a car crash in the Tanami Desert in Australia’s vast center, hundreds of miles northwest of Alice Springs. He was pursuing his greatest professional love – searching for impact craters. The car crash occurred almost exactly three years after the first fragments of the comet he helped discover crashed into Jupiter. His wife and co-worker, Carolyn, survived the crash with injuries. Some of his funeral ashes were onboard when, with its mission complete, NASA’s Lunar Prospector Orbiter crashed into a crater near the moon’s south pole, on July 31, 1999. The crater is now called Shoemaker Crater. "Gene Shoemaker." Famous Scientists. famousscientists.org. 07 Jul. 2014. Web.